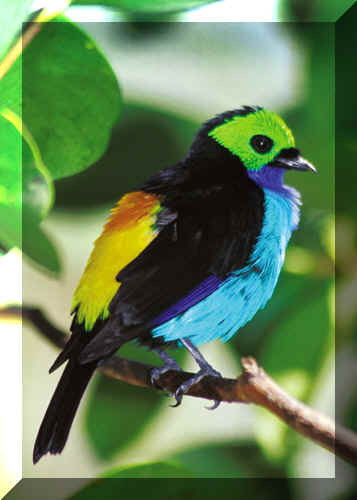 The Paradise Tanager is a beautiful 6" tanager which inhabits Columbia to Brazil and Bolivia. They tend to live quietly at moderate heights and do little to call attention to themselves. Both sexes are dimorphic (alike in general appearance). So they must be sexed by their behaviour. Black neck, shoulders, back and tail, accented by brilliant sky blue on breast, belly (with black in centre) and wing coverts; yellowish-green head; purple-edged wings; and red or yellow-red rump. Eyes brown, beak and legs black. 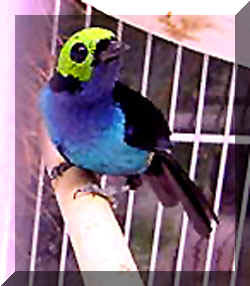 The Paradise Tanager, though brilliantly coloured, is said to have little or no song. A good diet includes soaked, dried currants and raisins, grapes, cut pear and apple, dates, figs, bananas, and halved oranges. In addition, insects (mealworms, fruit flies, wax worms, maggots and crickets) are appreciated. South America, east of the Andes and south to Bolivia and southern Brazil. Forests and woodland, up to about 4,921 feet (1,500m) elevation. Cover bottom of cage/Aviary with absorbent materials i.e. paper towels or layers of newspaper to soak up watery dropping caused by their sweet, juicy diet. Clean daily to avoid spread of disease and rancid smells. 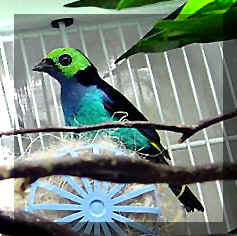 Using Easibed woodchip bedding/floor covering is ideal for these birds in an Aviary. A well-planted aviary with bathing facilities. Breeding results sporadic in captivity. Prefers to breed as high as possible, in variety of nest boxes containing coconut fibres, dead and live grass, leaves, moss, pieces of bark, wool and other materials. Likes to hide in corners on ground, may build nest free in thick shrub.